History of Present Illness: The patient was a 38-year-old female who was referred by her local ophthalmologist for an iris lesion and gradual decrease in vision of the left eye. As a child, she had suffered a penetrating injury with a pencil to the left eye that was surgically repaired. She had been stable until about 3 weeks ago, when vision in her left eye started to decrease. She was seen by her ophthalmologist, who noted an obvious iris lesion and sent the patient to the University of Iowa for further evaluation. 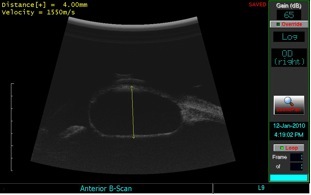 Based on history, clinical exam and echography, the patient was felt to have an iris epithelial inclusion cyst. The cyst was considered to be too large to resect. Three days after initial evaluation, there was spontaneous drainage of the cyst. 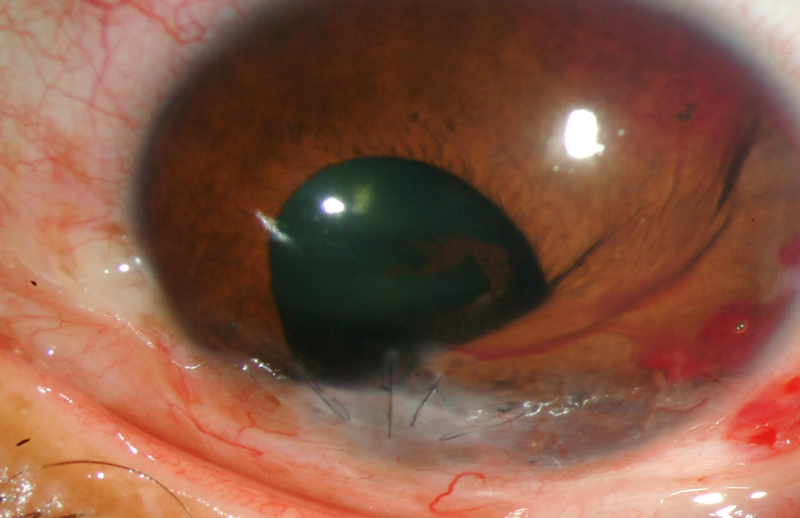 A tectonic corneal graft was placed in the area of the corneal defect. Histopathology of the host corneal button showed epithelial cells overlying the corneal endothelium further supporting the diagnosis. The cyst returned 6 months later. It was again felt to be too large to resect. The cyst was treated with intracystic ethanol irrigation. At postoperative week 7, the patient had 20/20 vision OS with pinhole correction, and the cyst was no longer visible at the slit lamp (Figure 3). On echography there was recurrence of a posterior cyst, although it was smaller than previously noted. 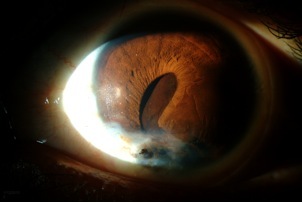 Iris cysts can be classified as primary or secondary. Primary cysts have no known cause and arise from the iris pigment epithelium or stroma. They tend to have a benign natural course, and visual disturbance is uncommon. Pigment epithelial cysts are darkly pigmented and can arise anywhere from the central pupillary margin to the peripheral iris. Pigment epithelial cysts are the most common lesions mistaken for iris melanoma. Ultrasound biomicroscopy is essential in narrowing the differential diagnosis if this is suspected. Pigment epithelial cysts can also dislodge and appear along the anterior iris, in the angle or free-floating in the anterior chamber. Stromal cysts are much less common than pigment epithelial cysts. These cysts are lined with non-keratinized squamous epithelium and have a translucent appearance. They are usually observed in infants and children. Secondary iris cysts can form as a result of epithelial inclusion, as a response to medications such as prostaglandin analogues or indirect acting cholinergic agonists or from cysticercus infection. Our patient was thought to have an epithelial inclusion cyst. Following surgery or penetrating ocular trauma, epithelium from the cornea, conjunctiva, or skin can implant into the iris, which provides an environment for further cellular proliferation and formation of an epithelial inclusion cyst. 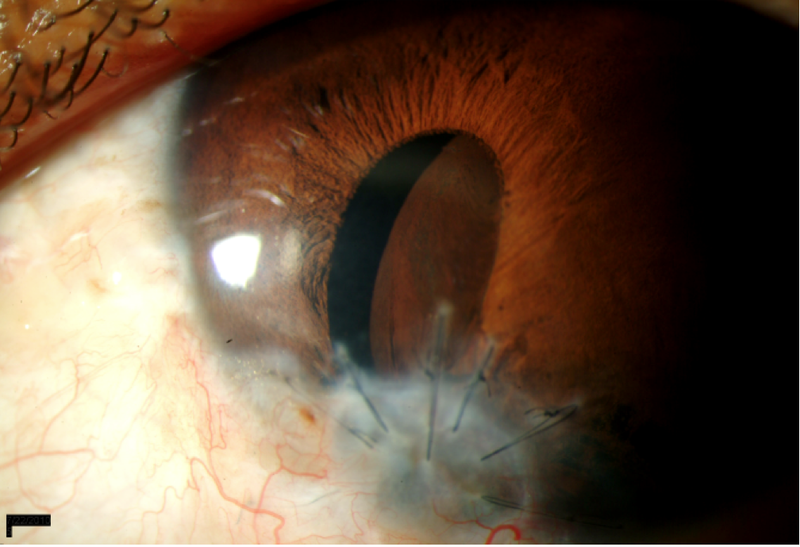 Further risk factors include incarceration of the iris or lens capsule, prolonged postoperative hypotony or poor wound closure. Compared to primary iris cysts, epithelial inclusion cysts tend to have a more aggressive clinical course and can result in decreased acuity, glaucoma, uveitis and cataracts. The presence of any of these complications should prompt treatment consideration. Many treatment options have been described in the literature including surgical excision, endodiathermy, cryotherapy, laser photocoagulation and injection of chemicals. Behrouzi and Khodadoust demonstrated the use of intracystic ethanol irrigation for the treatment of epithelial iris cysts (Behrouzi, 2003). This involves inserting a needle into the base of the cyst, aspirating the cyst fluid, replacing the volume of the cyst with absolute ethyl alcohol and removing the ethanol after 1 minute. 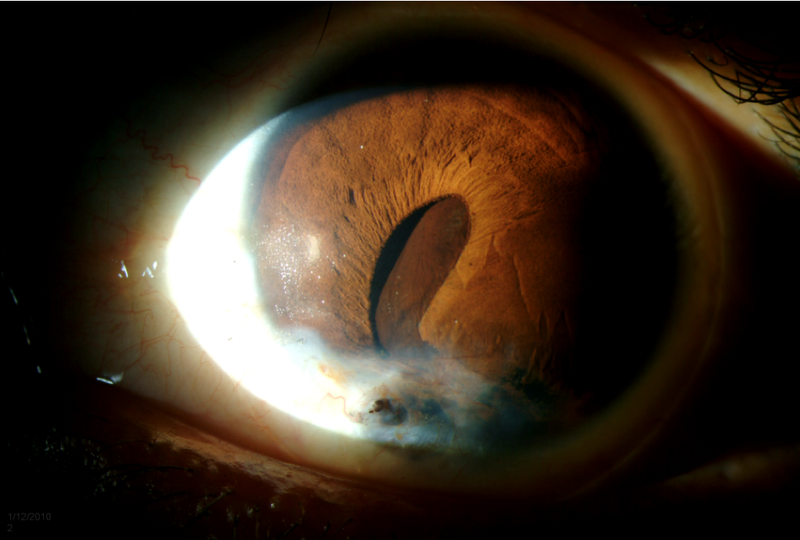 Risks of all treatment options include bleeding, endophthalmitis, cataract formation and cyst recurrence. Perhaps the most concerning risk in treating an epithelial inclusion cyst is the possibility of spilling epithelial cells outside the cyst, which could result in epithelial downgrowth.